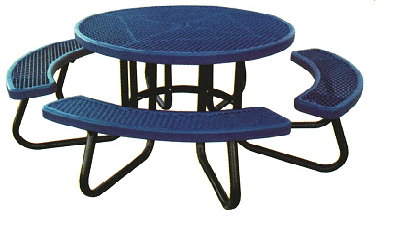 [XPB-CSRTRXVP-X] Our Plastic Coated Round Children's Picnic Tables are made of expanded metal with a plastic coating top and seats with a 48" diameter. The frame style has 1 5/8" O.D. legs which can be powder coated black, or hot-dipped galvanized after fabrication. Available in 9 color choices. For shipping quotes, orders or questions please call our Customer Service Center at 1-877-483-9270.